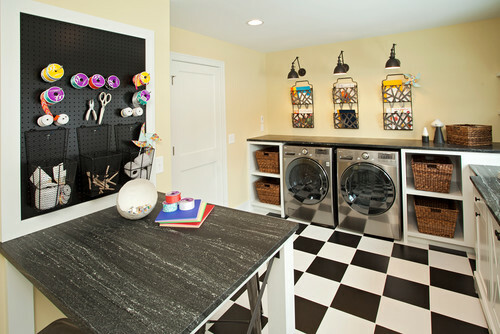 Tips for a Stylish and Well Organized Laundry Room - Let's Get Crafty! Hey guys! I’ve enlisted the help of Tia Jordan, a home decor consultant and blogger to share some great tips to help us “air our dirty laundry” or at least make it functional and pretty. 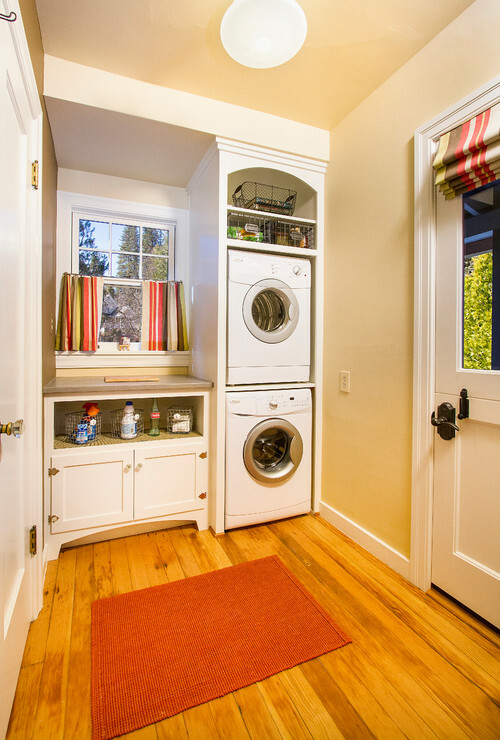 When is the last time you took a close look at your laundry room? Although this room serves an important function, sometimes it can end up being more practical than beautiful. Perhaps your laundry nook is stacked with messy piles of clean and dirty clothing and has become a home for random piles of rubbish? 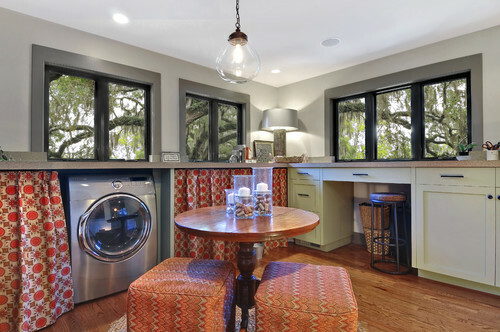 Having your own laundry room or nook can make the endless task of doing laundry for a family a little easier, but what if you want to make your laundry room a little more stylish and less cluttered? 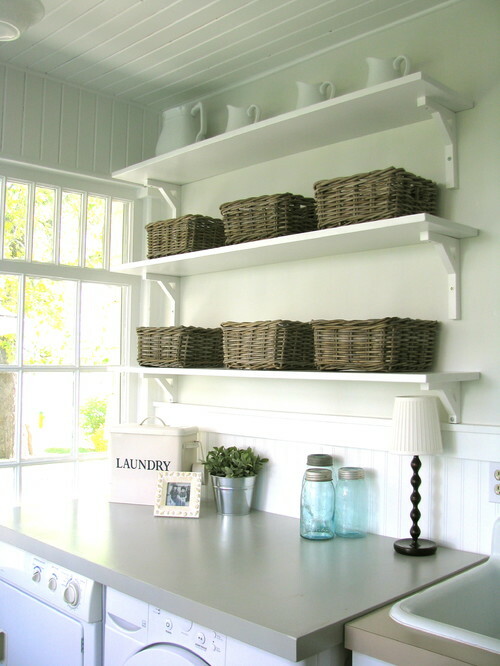 There are many ways that you can improve the laundry space in your home, so that this chore can be done in a beautiful and well organised environment. 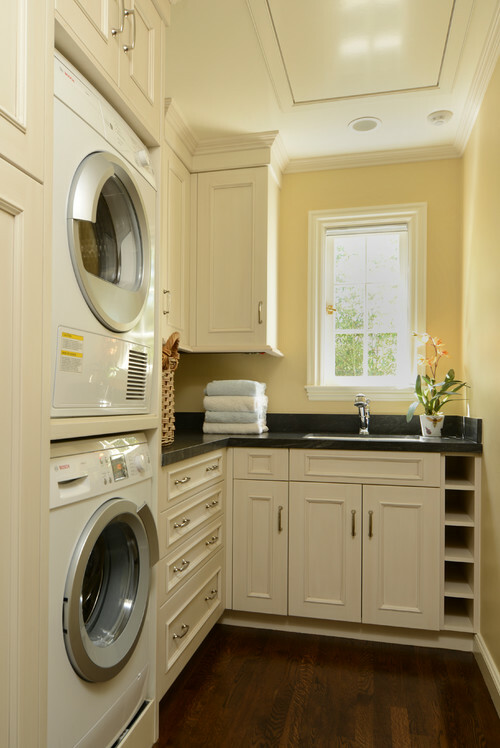 Sometimes your laundry room is part of another room, such as your basement or entry way. In this case, you might want to hide away the washer and dryer so that they are not always visible. This avoids an industrial look to the room. There are many ways to do this, but one of the most practical and stylish options are to hide the appliances away between a custom set of double doors. These can be designed specifically to fit your washer and dryer. 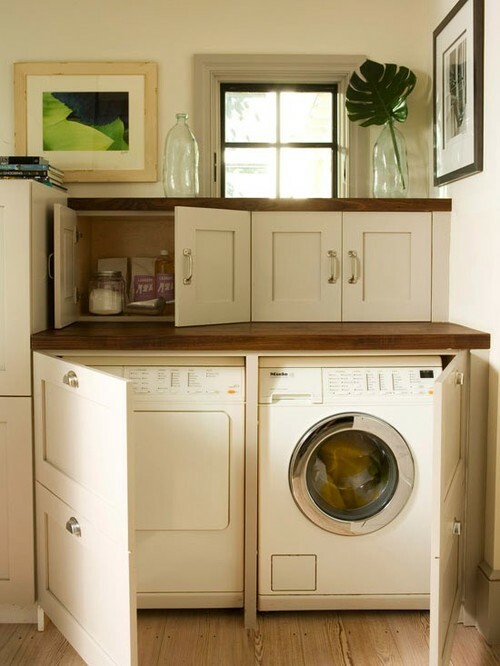 If you only have a small space for your laundry area, you can save a lot of room by stacking the washer and dryer on top of each other. Look around for a set of washer and dryer that are both front loading, so that none of the controls will be inaccessible when you stack them on top of each other. Also, make sure that your plumbing set up is properly configured to allow you to do this. You can find tumble dryers and washing machines that will stack easily on top of each other on specialist online stores. There are a lot of things that need to be stored in the laundry room, such as cleaning supplies, laundry detergent and an ironing board. 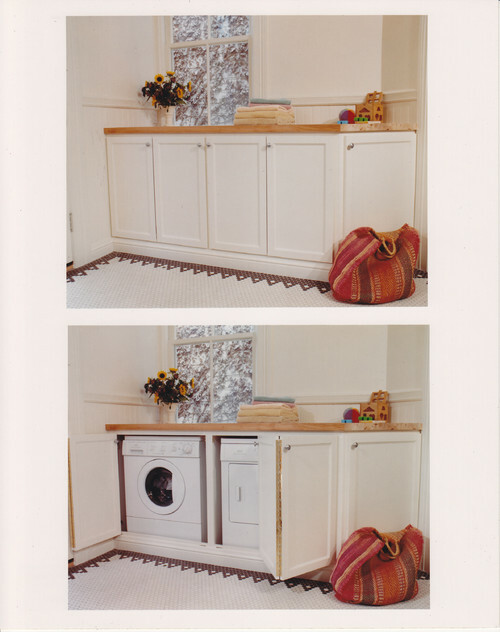 Instead of letting your laundry room turn into a cluttered space, put together stylish and practical storage solutions that will accommodate all of your needs. 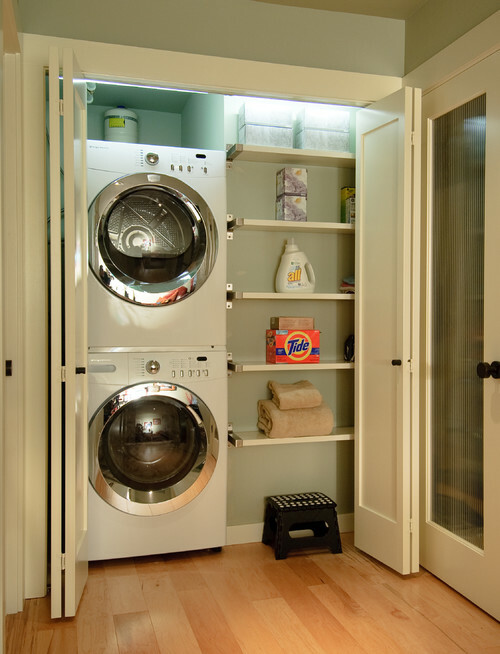 Also, your laundry room might also become a storage room for random items that don’t seem to belong anywhere else. Go through these items and determine what is useful and what is simply not worth keeping. Once you have done this, you can decide whether or not you want to keep the items in the laundry room in a designated storage space or whether you want to donate them to charity in order to reduce clutter. 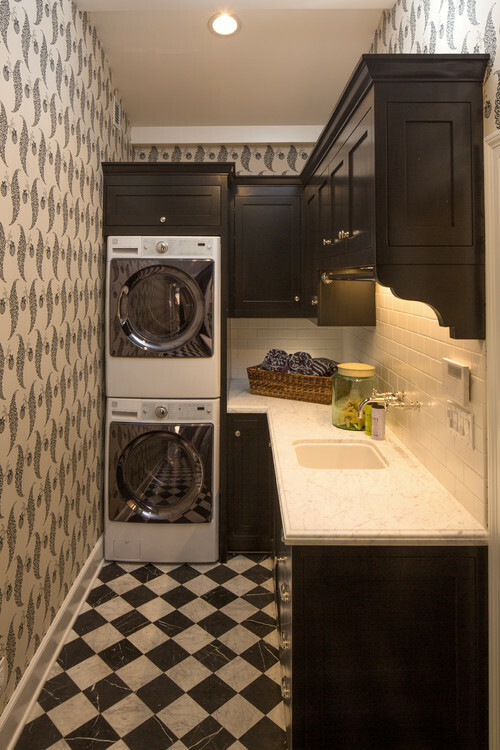 When it comes to the feel of the design of your laundry room, try to keep it light and airy. When you use a light colour on the walls of a laundry room, you will make the small space seem a lot bigger and brighter. Also, try to let in natural light as much as possible. This will help the space to feel cheerier and will also help you to see the clothes better – so that you can spot stains before you throw them in the wash.
Let’s face it; doing the laundry can be somewhat of a boring and thankless chore that never seems to end. 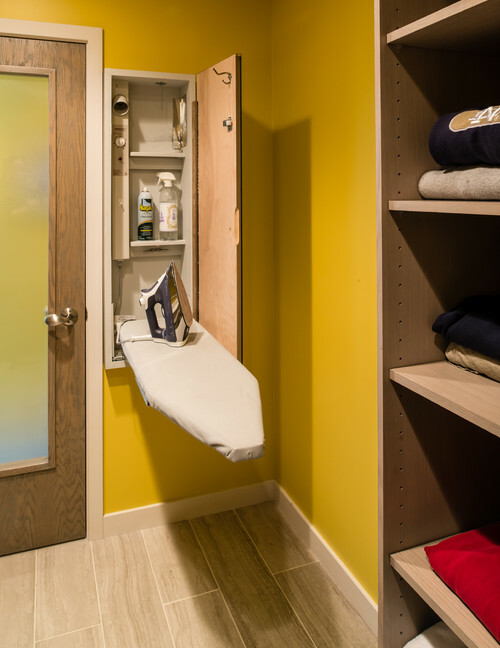 When you are designing your laundry room, why not put something in there that makes you smile every time you take a load of dirty clothes to the washer? It could be a beautiful painting, a happy picture of your family or a poster of a funny cartoon that makes you smile. It doesn’t really matter what it is, as long as it brightens up the space and makes you happy whenever you see it. Although your laundry room is a hard-working and practical space – it can also be a stylish, organised and beautiful part of your home as well. *Tia Jordan is a home décor consultant, blogger and mother of two. She likes to write about clever tips that can make your home more beautiful and functional. WANNA BE FRIENDS? ME TOO. Tour my house, meet my fur-babies, and laugh at all of my insane attempts at DIY. Sir Spam-a-lot doesn't work here. Whew, your emails are safe.